Dr. med. 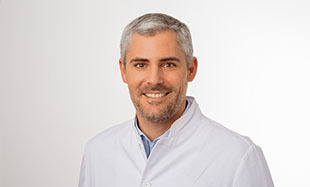 Alexander Rauch is a medical specialist in orthopaedics and trauma surgery. He also has the additional titles special trauma surgery ans sports medicine. He studied at the Ludwig Maximilian University and the Technical University in Munich. As part of his residency at the Klinikum rechts der Isar hospital in Munich, he was trained by Prof. Dr. Stöckle in trauma surgery and Prof. Dr. Imhoff in sports orthopaedics. With his recognition as a medical specialist, he moved to Landshut in 2012 to head physician Dr. Ganslmeier, where he established a sports orthopaedic department as senior physician. Here he specialized in the treatment of sports and joint injuries as well as injuries to the spine. Since December 2015, he has been a partner of Dr. med. Erich Rembeck at ECOM® Excellent Center of Medicine. He focuses on the surgical arthroscopic and conservative treatment of knee joint injuries. As a former competitive athlete in rowing he was able to achieve various national championship titles and multiple final participations in the German youth championship as well as a participation in the World Cup for senior citizens. He was also active in ski racing and achieved a bronze medal at the Bavarian Junior Ski Championships in slalom. Thus, the close relationship to sport was already established at the beginning of his professional career.